Winters Solutions came to my house to mount a 42 inch flat screen TV in my family room. After calling multiple other companies in the area, Winters Solutions offered a quote at a price point that I thought was extremely fair. I spoke to Joe on the phone and I explained the family room dimensions, what I wanted done, and how I envisioned it to look in the end. Joe completely understood my vision and was able to offer me recommendations over the phone to help me achieve the desired look (e.g., hide the wires, build a shelf for the cable box, etc.). I was extremely impressed and set up an appointment for him to perform the work. He called the evening before the appointment to confirm and on the morning of the appointment, he arrived on time (in fact, he actually arrived a few minutes early). I walked him to the family room and he immediately got to work, confirming with my wife and I the exact height that we wanted the TV hung on the wall. The TV mounting and building of the shelf took a little over an hour – this was the job that he was hired for and it looked great! However, he went above and beyond by pointing out that the cable wire (based on the configuration of my family room) was still exposed and couldn’t be hidden and cleanly fed into the back of the TV like the rest of the wires. He spent the next 15 or 20 minutes examining my house (basement, back of the house, etc.) to figure out how he could best hide the cable wire to give me the hidden, clean look I desired. He ended up hiding the wire under the floor and made a small hole at the baseboard to snake the cable up behind the wall and into the cable box. It looks great and gave the room the clean mounting look I was aiming for. Joe was extremely professional, knowledgeable, and polite. He thinks outside of the box and will help ensure you get the desired look by providing ideas and suggestions, which I thought was awesome. 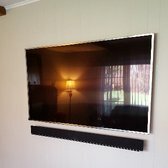 I HIGHLY recommend Winters Solutions if you’re looking for someone to mount your TV. I will be using them again in the future without a doubt! Thanks, Joe! I just used Winters Solutions to mount a TV and soundbar in my Family Room. I also wanted to relocate all my media components on the other side of the wall out of sight. Joe was super responsive (always calls back within an hour) and fully understood what I wanted to accomplish over the phone. He went through my options and even gave me tips on how to save a few bucks. He quoted me the best price of the few companies I called. On the day of install, Joe was on time and got to work quickly. He is super friendly and made sure the TV was the exact height I wanted it at. I was impressed at how carefully he measured everything to ensure everything was centered exactly. He wired everything exactly the way I wanted (since I had pre-programmed everything) and made sure we tested everything thoroughly together. We did a final check to make sure everything was centered and he was on his way. The whole process took about two hours and he was as pleasant as can be. The TV is more flush than I even had anticipated! I’d recommend Joe to anyone in the area who needs AV work done at their home or business. First and only choice for any electronic installation in New Jersey! My company recently hired Winters Solutions to install a IP Security Camera System with six cameras. The challenge for us was that we are in California but we needed to install the cameras at our warehouse in New Jersey. Joe is a full service installer. He was there on time, and kept me updated with his progress. He made sure to call me and clarify before installing if there was any variation from our original plan. After the installation, Joe configured our NVR, opened ports on the router for remote viewing, and walked us through the remote viewing process to make sure we saw everything and were happy before he left. We couldn’t have asked for a better installer. Thank you Joe for making this seemingly difficult task so easy. I had a pretty basic install of my new 60′ TV and everything went great. Joe was pleasant, experienced, and the job took only about 40 minutes. 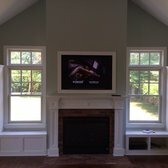 I highly recommend this company for anyone looking to mount a TV or do any type of home theater installation. They came on time. Neat, knowledgeable, & fair. Joe was really good. Great service, very easy to work with. Going to use them again! Mounted my 60in Sammy over a brick fireplace. Did a good job. Was quick and efficient. Price was reasonable. Was a very nice guy as well. Would definitely hire again and recommend to others! Joe Winters did an outstanding job installing and properly wiring my entire sound system and television -which included both indoor electronics and outdoor speakers. After a less than knowledgeable individual had left me stranded with a half-done job and the wires a tangled mess, Joe came in, ensured all components were in good working order and then reconnected everything in the proper way. I was incredibly impressed with his professionalism, attitude and ability. If I have any other electronics that need to be installed in my home – he will be the one I call. I highly recommend him. Very professional and courteous service. 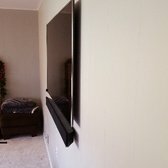 He mounted our 47″ tv on the wall along with a sound bar. The mount I had would not fit my tv correctly and thankfully he carried mounts in his truck which I was able to purchase. Everything was done in a neat and orderly fashion and we are extremely pleased with the installation. I would recommend Winters Solution to anyone looking for quality tv installation in their household. Called Joe on a Saturday. Very courteous and didn’t rush me off the phone even though he was on a job. Said he would call back later in the day and kept his word. Was at our house the next day (a Sunday during football season) and was on time, professional and very knowledgeable. He knew this was not going to be a huge job but treated it with the same service. I asked about new technologies and he made a few suggestions without being pushy at all. Very impressed and will be using his services in the future. Highly recommended. Outstanding service and super professional! They came and mounted our 60 inch Samsung flat screen with wire concealment, 100% pleased with the job. Very reasonably priced. What a great experience working with Winters Solutions. 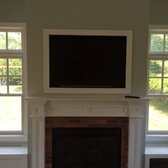 Had a articulating wall mount installed above the fireplace – chose not to have additional services since I am in a rental. Busy as they are took a little bit of time to get scheduled but they were totally flexible with my timing requirements and with my requests. On time arrival, great attitude and customer service and good explanation of options. Very pleased with the quality of the mount they installed. I will keep it short and sweet. These guys are great! They did a great job mounting 4 Televisions and installing outlets!!!! I would recommend them to anyone!!! Called up for a Satellite dish adjustment, came out same day and was able to provide a solution. These guys are great! Joe was a real pro with a lot of imagination. After a very disappointing experience with Best Buy where they said there were too many road blocks to run the cables behind and up the fireplace Joe came in and was able to complete the job in under 2 hours. He got me a great deal on a TV and was able to hook up Sonos to make it look seem less. I would highly recommend him to anyone looking to enhance their tv rooms and home theaters. They replaced two Bose outdoor speakers we had with new ones and fixed the rock speakers around our pool. They hooked us into a Sonos system which allows us to access so much music and makes it so easy to do! My whole family has cell phones and we ALL can add, access and play music for our backyard parties this summer! The sound is amazing! They also replaced our indoor sound system with new Bose speakers and a new Bose sub-woofer. We now have the most amazing surround sound for the 70″ flat screen tv in our family room. Not only do we have a new simple-to-use universal remote for our cable, DVD, Netflix, etc., they hooked us up with a Harmony app on our phones so we can use those as remotes as well! Surround sound is CRAZY – can’t wait to watch some good movies with this new system! The best part is all of this “high-tech stuff” was easily taught to me, and I am not “high-tech savvy” in the least. : ) I can easily relay all instructions to my family when they get home! Joe and his partner were totally professional, courteous, neat and did their work in a timely manner. Joe was extremely patient explaining all the new apps, remotes, etc. to me and made sure I understood everything before they left. He even wrote us notes…just in case. ; ) I highly, highly recommend Winters Solutions! Joe and his crew installed a sound system in our home, and we are very happy with the product. He is very experienced, responsive to our questions and completed the job on time. He replied to our emails and phone calls promptly, and we received great service at a great price! Winters Solution responded immediately and returned phone calls promptly. I needed help with my home stereo system. I was desperate for music at our summer home. Joe reacted quickly and fit an appointment into his schedule to accommodate me. He arrived just when he said he would. This young man was extremely knowledgable and corrected the problem. Their prices were fair and I would highly recommend him for installation or repair. I’m glad I found this company on Yelp. Joseph is knowledgable and honest. He made calls before arriving, showed up on time and did a nice job repairing and installing our satellites. This hard working young man earns his credit to be highly recommended. We received Joe’s contact information through my husband’s coworker, and the experience was as great as his coworker said it would be! Joe was very responsive, and completed the job within a few days after our initial contact. We have an almost 7 month old, who is very active and will soon be crawling, so we needed to mount the TV as soon as possible in order to make more room in our living room for her. He did a very neat and amazing job with the installation! Highly recommend this company. Very professional and courteous. Did a great job on a complex installation. Called in the Am, Joe and his partner arrived around 3 hrs later and placed my 55″ above our fireplace mantle in a very tight spot with no difficulty. the mounts were off of fitting the back of tv no problem for Joe enlarged holes for screws to fit into the right spot on rear of tv. it was placed perfectly center above fireplace. Price very reasonable work expertly done and cleaned. my wife couldn’t have been happier. Thanks Joe. Probably the friendliest and most helpful team I’ve worked with. Set up my DirecTV and cleaned up my computers in the fastest time I’ve ever seen. If there was an easy button for home services this would be it! I would recommend these guys for anything. The owner is extremely professional and oversees every job to completion and beyond. Prices are also very reasonable. I’ll be using these guys the rest of my life. Joe really helped me out a lot! I’ve had DirecTV service for years and I recently bought a townhouse and had my service transferred over. I made it as clear as I possibly could to the first DirecTV install tech that he must mount the dish on the rear chimney exactly how they’re mounted on all of the units next to me and throughout the entire complex. He told me he can’t do it because it’s the rules for DirecTV installation, they’re told they can’t go on the roof or mount anything on a chimney, I tell him it must be on the chimney, the Homeowners Association is very adamant that nothing gets mounted on the roof. The idiot didn’t listen, he went and mounted it on the roof anyway after I went inside my house. The HOA contacted me and told me it must be taken down and re-mounted on the chimney. I call DirecTV, they send Install Guy #2 out to fix it. He refuses to do anything, he said he’s not allowed to go on the roof because of their work rules and insurance reasons, he leaves. I call DirecTV and they tell me those rules don’t exist, the install techs are supposed to install the dish wherever I tell them to install it. Install Guy # 3 shows up and again he refuses to do anything, except to take the dish off the roof, because again I’m told their work rules prevent them from mounting the dish on the chimney or even going on the roof, he says they’re not allowed to get off the ladder. So, I was without TV service for nearly 2 weeks. I searched online for someone in the area that would re-mount my DirecTV dish and found Winters Solutions. I called Joe he showed up 8 am on a Saturday morning and did exactly what I needed him to do. I would highly recommend Joe for any installation needs. In fact, I got a bunch of business cards to give to the HOA, for whenever DirecTV does this to people in my townhouse complex in the future. Comments: Awesome and professional service. Made the mount process look darn easy..which made me think could i do it myself? Comments: First of off, this company came out on very short oyo e to mount our brand new 65 in TV on a Sunday. That was very nice of them to accomodate. It was two clean cut young men who showed up, and they were early!! Very nice and very friendly. They even Cleaned up afterwards. 5 Star service! We could not have asked for anything better! Comments: I called them to mount a TV in my living room. They were really good, experienced and professional. On the day of the install, he kept me updated about what time I should expect him to be at my place. They came on time and were done in about 90 minutes. The job was well done, and looks very neat! I am very happy with their service and will definetely recommend them to a friend or will call them again if I need to get anything else done! Comments: Did an awesome job. Called me within minutes of quote being submitted into servicemagic.com. Price was great. Even did a little “above and beyond” to make project better than I asked for. Comments: I needed to hook up a tv and sound system.He came right on time, was very pleasant and friendly. The job was completed quickly and expertly. Comments: Joe was nice and friendly. Comments: There was alot more snow than expected, but when I looked in the morning, Joe had cleaned what he said he would, plus brushed alot of my car. Comments: Very profesional,honest and friendly. Very satisfied with job and completed on time as estimated. Comments: My rating is 5 stars! Winters Solutions scheduled a quick appointment because we needed it on time for the holidays. Our television looks fantastic on top of our fireplace. Many thanks! Comments: They were on time and knew what they were doing. No complaints and will hire them again if need be. Comments: Absolutely thrilled with the service!! Did a wonderful install. I had the wires concealed in the wall and Joe did a great job!! Comments: He was on time & did the job very well… happy with the service, would recommend …. Comments: They are very professional and reasonable. They came on time as they promised and finished the job with out any problems. Comments: I would highly recommend Winter Solutions to anyone who needs their television mounted. They were on time, very professional, and took great pride in their work. I have absolutely no complaints! Comments: I hired Joe from Winters to hang my tv and hide the wires. Joe was extremely professional and fair with his price. He came on time to do the work and the work was done with ease and neatness. I was very impressed with him and I would hire him again. I would highly recommend him. Comments: This company did a great job hanging my 65 inch flat screen tv. They were very professional in every way, and I would highly recommend them to any one looking for professional service. Comments: Top Notch! Professional Installation at a very reasonable price. Appointment was right on time and the quality of the work was second to none. Highly recommended. A++++! Comments: Joe was on time, curteous, well-spoken and polite. He assessed the area for the mount, gave me a clear estimate of costs, and explained the procedure. When the mount was available, he called and set up another appointment. Once again, he was on time and comleted the job with little mess or problem. I love the job he did and would recommend him with complete confidence. Comments: The project turned out really well. The guys were very professional and did a great job. They were on time and got straight to the job. They were also very receptive to my suggestions and put in the extra effort to make sure that I was really satisfied with the work. I would definitely recommend them. Great job. Comments: Very kind and patient . Very helpful. Comments: Installers arrived on time and completed the job as expected. Comments: Joe did a great job explaining the problem i had with my computer. The problem was fixed in no time. They take pride in making sure your PC is repaired the right way at a very reasonable price. I would recommend that before giving up on your current PC, check with Winter Solutions before purchasing a new one. Thanks to Winters Solutions, my Dell works like new.